1. Are donations to Family-to-Family tax deductible? Donations made directly to Family-to-Family are tax exempt. Family-to-Family, Inc. is a non-profit organization, tax exempt under the 501(c)(3) section of the Internal Revenue code. Our federal tax ID number is 57-1169066. However, donations of any kind sent by a donor directly to a sponsored family are not tax exempt. This includes food and other items purchased, packed and shipped to a sponsored family care of the address of one of our community partner organizations. 2. How does Family-to-Family select the communities it sponsors? The communities we sponsor are chosen for the most part based on U.S. Census Department poverty statistics. We also research the specific needs of the community through conversations with local school officials, food pantry directors, church leaders, or other outreach workers who have detailed knowledge of the area. 3. How does Family-to-Family decide which families need help the most? 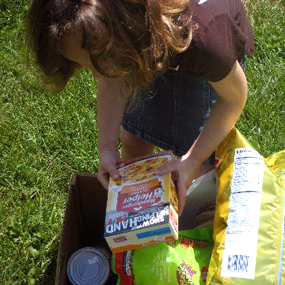 Local outreach workers are the ones who identify families for sponsorship; families must live under the U.S. poverty line** (see below) and/or be eligible for food stamps (SNAP) or WIC, or children in the family must be eligible to receive free or reduced lunch in their local public school. Family-to-Family relies on our outreach partners for specific knowledge of the needs of families in their communities. A family’s eligibility is partly determined by a detailed initial questionnaire, supplied by Family-to-Family to our community outreach partners, and we require each applicant family to supply a food stamp id card or other documentation of income. 4. What does it cost to sponsor a family? We have six family donation programs, and costs for each are slightly different. Option 1: Individuals (or individual families) that sponsor a family through our online cyber-sponsorship program and who shop for and send “monthly drive items” (non-food basic necessities). Costs: $36.50 online per month for food plus $10-$15 for optional non-food items. Shipping for non-food items varies depending on size and weight, but we estimate on average $7-$10 per month. (APPROXIMATE) TOTAL: $55 PER MONTH (or $36.50 per month if you choose not to send optional non-food items). Option 2: “2 for 1”. Individual donors or donor families share a sponsorship of a family in need with another donor through our online donation program. Costs: $18.50 online per month for food plus $10-$15 for optional non-food items. Shipping for non-food items varies depending on size and weight, but we estimate on average $7-$10 every other month. (APPROXIMATE) TOTAL AVERAGES $40 PER MONTH (or $18.50 per month if you choose not to send optional non-food items). Option 3: Individuals or families that sponsor a “gap” family in Beverly, Kentucky. The family “shops” at the Red Bird Mission “Gap Pantry”. Costs: automatic monthly donation of $11. Option 4: Individuals or families that sponsor a Refugee or Refugee family. Refugees receive a monthly gift card to a grocery store near where they live. Cost: automatic monthly donation of either $55 for a full sponsorship or $27.50 to share a sponsorship. Option 5: Individuals or families that sponsor a Veteran in need. Veterans receive monthly groceries at the supported housing facility where they live. Cost: $36.50 per month for a full sponsorship or $18.50 to share a sponsorship. Option 6: Individuals or families that sponsor a Holocaust Survivor in need. Survivors receive a monthly gift card to a grocery store near their home. Cost: $55 per month for a full sponsorship or $27.50 per month for a shared sponsorship. 5. If I donate funds monthly to sponsor a family, how is my donation used? Your generous monthly donation helps Family-to-Family provide desperately needed food to families registered with our organization. Working with our partners on the ground [e.g., Feeding America food banks, Walmart, Kmart, IGA, Shoprite (see #11 below for a complete list)], F-to-F is able to provide all of our registered families with enough groceries each month to provide an average of 15 meals for their entire family of 4-6 members. Approximately 96% of your monthly donation supports Family-to-Family’s program costs, outlined above. The remainder of your donation supports F-to-F’s general operating expenses, helping to ensure program accountability and subsidizing research into new communities in need. Please feel free to contact us with any questions you may have about how your monthly donation is used. 6. What if my sponsored family doesn’t pick up their food? If a sponsored family doesn’t pick up their food and can’t be reached by our community partner for two consecutive months, the food provided with your donation will be given to another family in need in that community. 7. What if I want to donate more than the requested monthly donation for food for “my” family? While it is very generous and kind to donate a larger amount, it creates difficulties in our recipient communities if one family receives a significantly larger amount of food than other families do. So, if you donate more than the requested amount each month, the extra amount will go to our Emergency Food Fund to purchase groceries for families that are between sponsors. However, in the case of very large recipient families (8 people or larger) we do encourage sponsors who are able to consider signing up twice (in essence making two monthly donations) for groceries for “their” family…. or we assign two sponsors to the same family. 8. Can I help families in my own community through your program? Our sponsorship program matches families at a distance (usually families living in different parts of the country) in order to respect the privacy of both sponsoring and sponsored families, so we would not match you with a family in need in your own community. However, if you’re interested in helping local families, you can join our Give Where You Live program and donate a regular basket of groceries to a local food pantry. 9. Can I choose the community I’d like to help? 10. Can I share sponsorship of a family? Yes! We have a 2-for-1 shared sponsorship program, in which two families share a sponsorship of a single family in need. Each donor family donates $18.20 a month online. Read more. 11. Where do the groceries that are purchased locally come from? We purchase mainly discounted food from a variety of partner food banks and stores, depending on the location. 12. How much communication from my sponsored family can I expect? Family-to-Family strongly encourages communication in the form of letter or email writing between donating and sponsored families. We believe that communication not only creates community across the miles, but also that it expands the world and creates possibilities for families living in poverty. At the same time, donating families should understand how difficult the act of writing a letter can be for people living in places where there is widespread illiteracy, a lack of motivation, and in some cases (e.g. The Navajo Nation) a language barrier. For many of the families we help, writing anything is rarely a part of their home life. If your sponsored family does not write back to you, do let us know, and we will contact our local community outreach partner to see how they might assist. However, please do understand the limits living in extreme poverty places on your sponsored family… and know that their need for the food you provide remains great.